See the Law of Detachment in action! 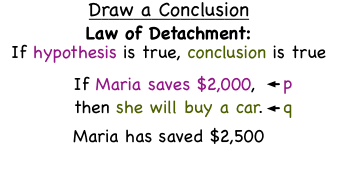 This tutorial shows you an example that uses the Law of Detachment to make a conclusion. If you have related conditional statements, the Law of Syllogism can help you link those conditional statements into one conditional statement. In this tutorial, you'll see how to combine related conditional statements using the Law of Syllogism.